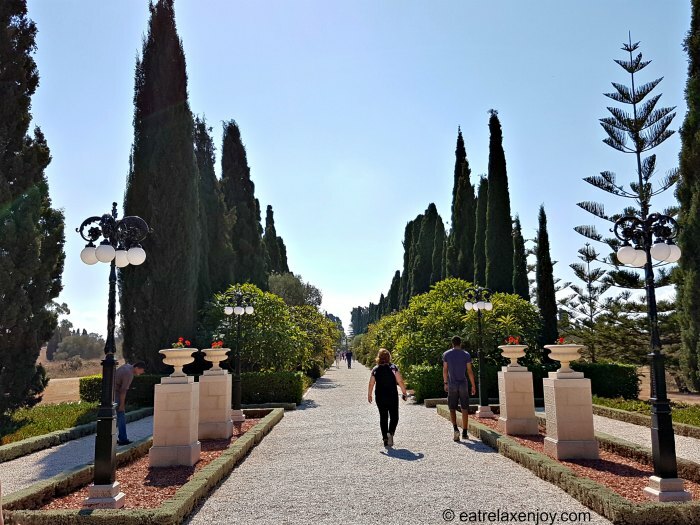 Acre Bahai Gardens is a small attraction. 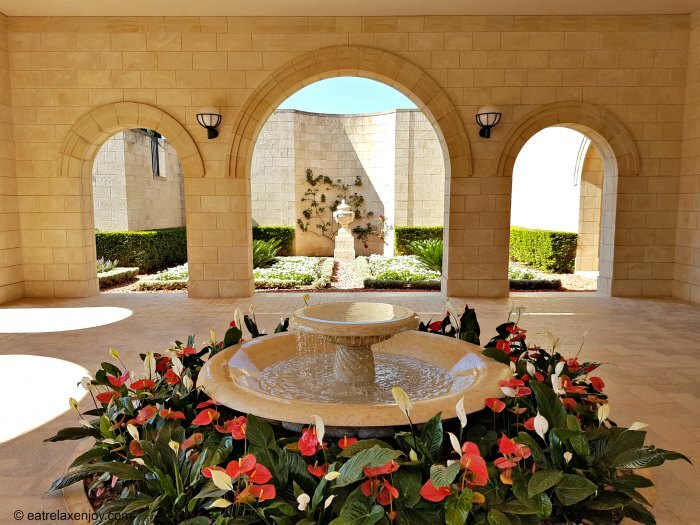 Visiting the gardens includes the gardens and Baha Alla Shrine, where Baha Alla, who established the Bahai religion, is buried. I wouldn’t recommend traveling to Acre just to see the gardens. But if you are already around, it is worth going to see them. Admission is free. The estate is where Baha Alla (Mizra Ali Mohammed) spent his last years and where he was buried. 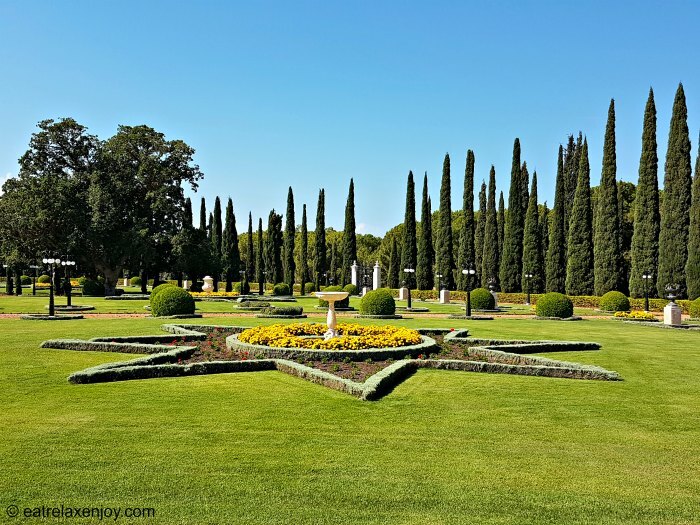 The Acre Bahai gardens are accessed from road 8510 the entry road has free public parking. Once you are in the gardens, you pass by a nice structure with Middle Eastern architecture. 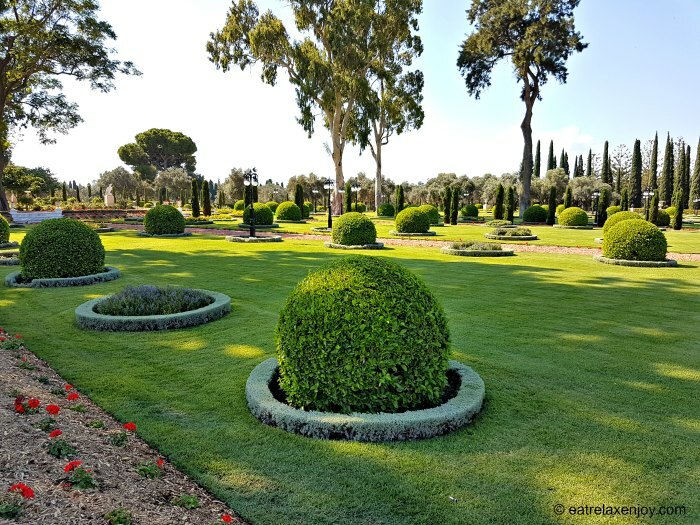 The Acre Bahai Gardens have two parts – outer and inner gardens. The entrance to the inner gardens is possible only in the mornings (until noon) and is guided. 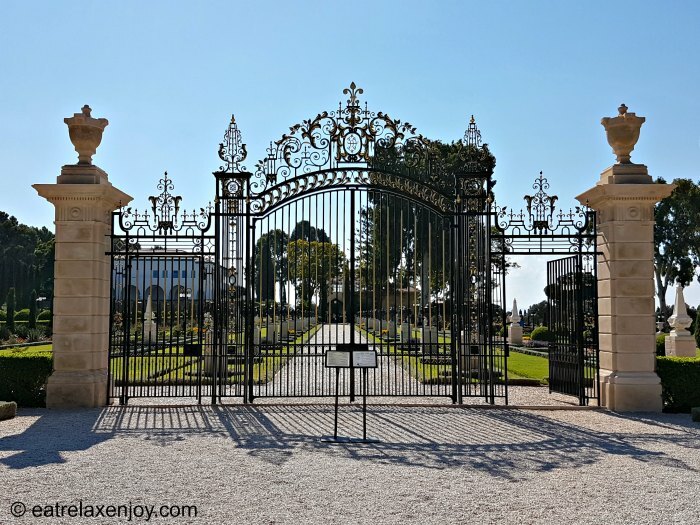 The entrance is via the outer gardens via a long cypress boulevard. The path is covered with gravel so if you have accessibility issues, you’ll need to go via the paved path, located behind the cypress trees. If you come here during the summer (or any season other than winter) – arrive early as it gets quite hot and humid here in the sun. After the boulevard, you’ll see a big gate to the inner gardens, where Baha house is (the white building on the left hand side) and the burial shrine (in the front, small building under the trees). The shrine itself is not very appealing. It is very modest. A patio in the middle, with meditation rooms lined with Persian rugs (no photography is allowed in the shrine). 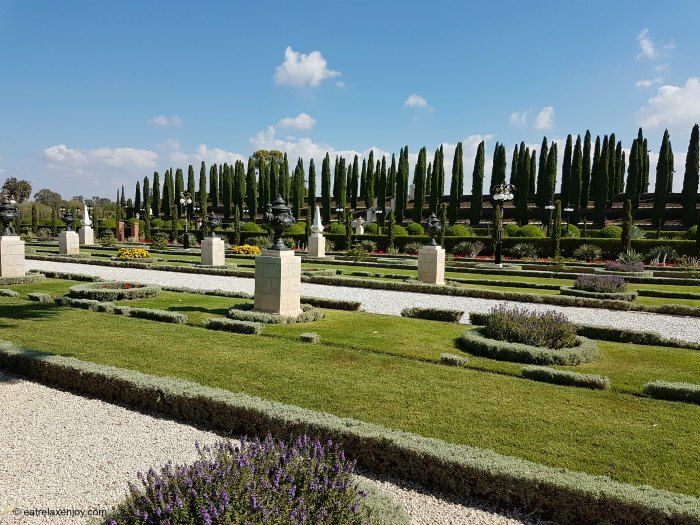 However, the inner gardens are especially designed and groomed with landscape and garden architecture: green lawns, sculptured bushes and garden beds with flowers. This makes the visit here worthwhile. Take into consideration that access is only allowed in the main paths to the shrine (in the photograph below). While in the inner gardens, look around. Here are some photographs of the inner gardens. The first two are to the west. Here’s a photograph east, to the path to the house and shrine. I saw some aerial photos of the complex and gardens, in which it is evident that the gardens are especially nice from the air. Too bad there is no higher overview of them. 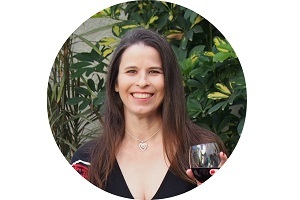 You migth want to read also the article: A visit to the Western Galilee. 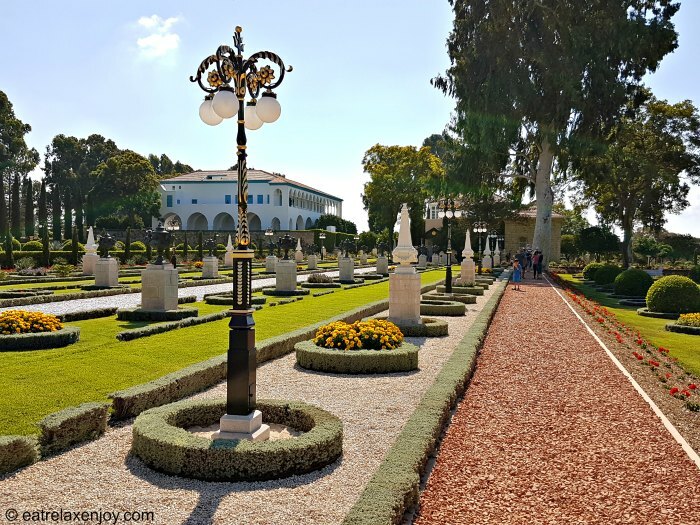 The Bahá’í Gardens in ‘Akko, road 8510 (north entry to Acre from road 4). · The visit takes 30-60 minutes. · The gardens are open 9-16:00, the inner gardens are open until noon. On Saturdays there are free guided tours. · Entry is with modest clothing – shoulders and knees must be covered.